In stock -This product will ship today if ordered within the next 14 hours and 53 minutes. This natural moisturiser is made without Parabens, Lanolin, phthalates, artificial perfumes, petrochemicals and colourants to bring you the purest children`s moisturiser that nature can offer. Aqua, ^*Elaeis guineensis oil, *Helianthus annuus seed oil, Cetearyl alcohol , *Olea europaea fruit oil, Cetearyl glucoside, Glyceryl stearate , Levulnic acid, *Calendula officinalis flower extract , *Aloe barbadensis leaf juice powder, Sodium stearoyl glutamate, Aroma [^*Lavandula angustifolia herb oil], Rosmarinus officinalis leaf extract, ^Commiphora myrrha oil, Potassium sorbate, Citric acid, *Linalool, *Limonene . All Green People products that contain essential oils use them at concentrations of less than 1% therefore all Green People personal care products (including sun lotions) can be safely used during pregnancy. 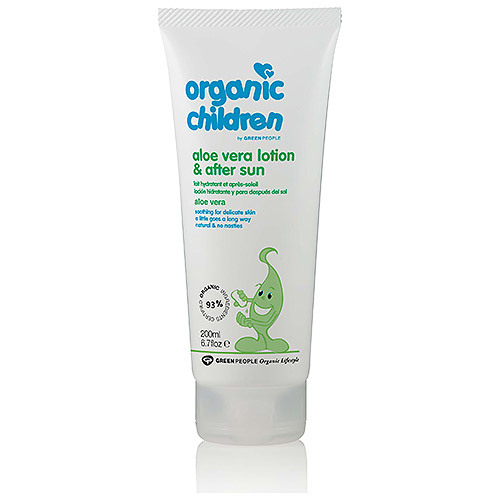 Below are reviews of Organic Children Aloe Vera Lotion & After Sun - 200ml by bodykind customers. If you have tried this product we'd love to hear what you think so please leave a review.